We offer an in-house pharmacy, which means that your pet will receive precisely the right medication at precisely the right dose. We’re also available to show you how to administer the medication and monitor its degree of effectiveness. Ensuring that you have convenient and timely access to competitively priced medications is an important aspect of your pet’s veterinary services. 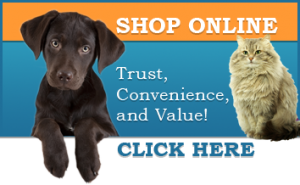 Our in-house pharmacy has a complete inventory of pharmaceuticals, vitamins, shampoos, flea and tick control products, and heartworm preventatives. We also carry prescription diets. Pets are living longer, healthier lives than ever before and a big part of that is due to our expanded knowledge connecting proper nutrition with overall good health. During your pet’s physical examination, we evaluate his or her body condition and suggest recommendations based on what we find. Our doctors can assist you with information on proper serving size and other feeding strategies so your pet can maintain his/her optimal body weight and appropriate nutritional requirements.Dogs and cats are healthiest when they eat whole, well-balanced properly formulated foods. A high quality food provides a greater nutrition, with calories and fats formulated to fit the needs of your specific dog or cat. Prescription diets benefit medical conditions such as liver disease, bladder and kidney stones, renal failure, obesity, food allergies, diabetes, and more. Some pets have more serious nutritional challenges or chronic conditions that can require a special diet. If your pet is diagnosed with a specific condition, we may recommend feeding a special prescription diet. 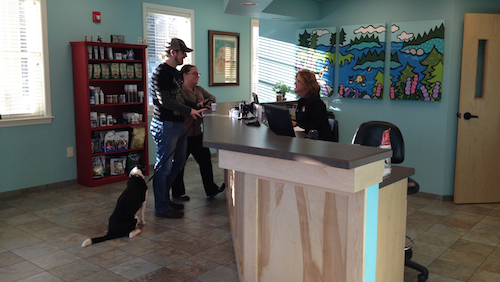 Saco Veterinary Clinic carries Hill’s Science Diet, Purina and Royal Canin prescription diets. Would you like to know more about all the ways the medical team at Saco Veterinary Clinic can help your pet get well and stay well? Give us a call at 207-571-9580 or send us an email today! At Saco Veterinary Clinic, we are here to support you through all the stages of your petâ€™s life. End of life care for your pet brings about both difficult and emotional decisions. We will extend to your individual needs the utmost of compassionate, caring and respectful services to help you through this process. For so many of us, our beloved pets are truly a member of our family, when the bond we share is broken the resulting sense of loss and grief is real. Sadly, everyone who cares for a pet will one day face illness, traumatic injury, old age and or quality of life decisions.